We were requested to undertake all the plumbing and heating requirements for this very high spec country farmhouse renovation. Works included new column radiators, underfloor heating, an external high efficiency oil boiler, a large un-vented hot water cylinder, a designer En-Suite with a wetroom type shower area and two basins. 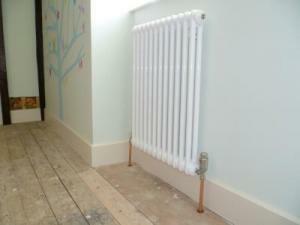 Here are a few photos of some classic column radiators which we installed.